In 2017, Bryant won alternate prize for the 2017 MTNA Junior Piano Division! Bryant performed on Show 321 in Lake Jackson, TX, on March 4, 2016. 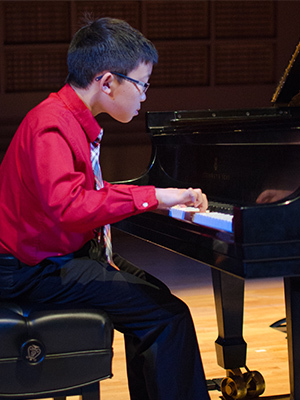 Bryant Li (piano), 11, is from Katy Texas, where he is a fifth grader at Roosevelt Alexander Elementary School. He studies piano with John Weems. His musical accomplishments span numerous awards in competitions, including first place in Clear Lake Symphony Youth Concerto Completion, Overall Winner in Blinn College Young Pianists Competition, and first place in Rochelle Liebling Kahan Competition for Child Piano Prodigies. He has also won the Houston Forum Young Artist and Houston Young Artist Concert Artist Award, and more. Outside of music, Bryant enjoys public speaking and debate as well as playing soccer.